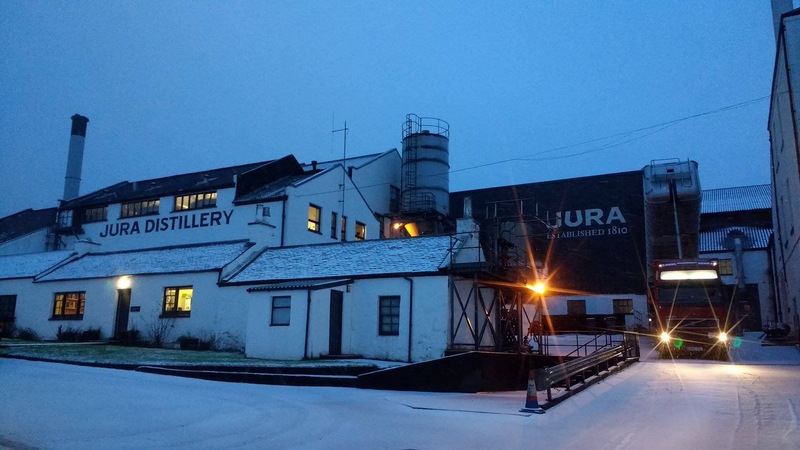 Rachael Jones is the Distillery Visitor Centre Manager at Jura .. Originally from North East England, Rachael moved to the island of Jura in the summer of 2011. 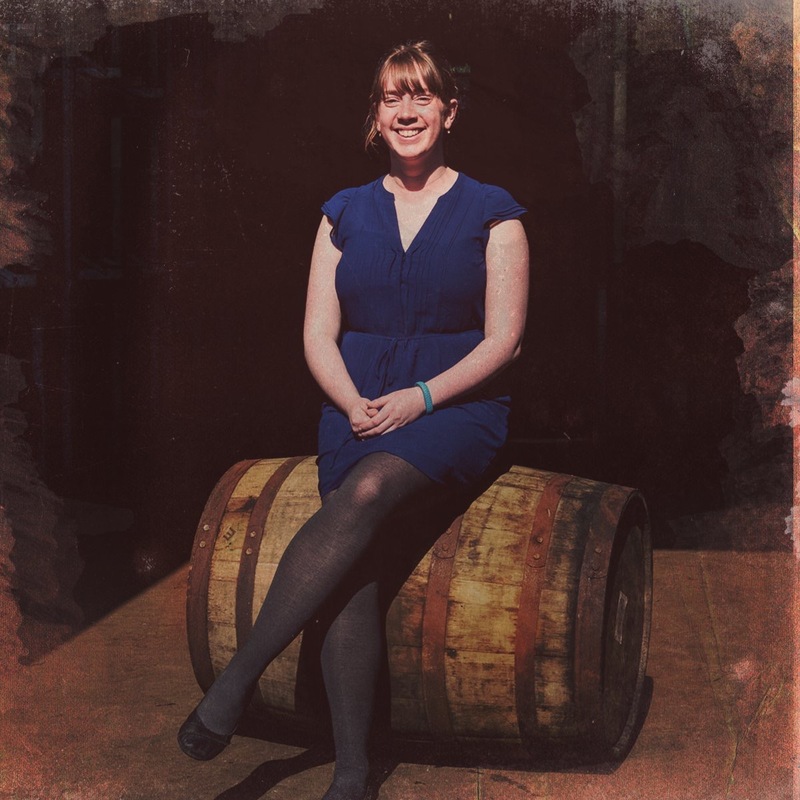 She spent the next few years working at the island’s only hotel, The Jura Hotel, and the striking Jura Distillery Lodge before following her passion and taking on the role of Jura Distillery Visitor Centre Manager in the summer of 2015. As it happens Rachael was one of the first people I spoke to when setting up my whisky blog so it only seemed right to ask her to be involved..
Day at work for ocdwhisky Blog. 8am; Get into the office, I have brought a large pan, food processor and a set of speakers to use in the Jura lodge later, so straight upstairs to set them all up. In the lodge I double check that there are enough plates/glasses and check the whisky stocks – we’re hosting a group of Germany journalists and bloggers who will stay with us here for a couple of days while exploring the island and our distillery. Back in the office, something’s wrong with my computer so I call IT for a confusing chat, but manage to fix the problem, if only temporarily! Now the computer is working I start by answering emails from people looking to visit the distillery. I always try to encourage people to book in advance; it can be disappointing when people turn up without booking and to find the tours are full – particularly given the distance people travel to get here! Once the tour emails are done I quickly read over my own emails, and answer what I can. I then have a quick walk around the distillery to check that everything is in order before today’s tours begin. It’s a working distillery and as we have an electrician onsite today people will really get a feel for what it’s like to work here! 10am; I take the first tour, it’s a small group of 6 people and a mixed bunch on the knowledge stakes, which is always a bit of a challenge. You want everyone to be able to understand what is going on, but you don’t want the people who have done lots of tours to get bored! Tour went well (I hope, I am always nervous on my first tour back after a holiday! ), there were some really good questions, and there was a real bonus for everyone in that we were able to take a look into the stills. Without any production going on the group were able to take photographs everywhere! I then gave those that weren’t driving a wee taste of our brilliant Jura whisky; everyone enjoyed their whiskies, and as usual everyone seemed to have a different favourite. During the tasting, the group from Germany I was expecting arrived slightly earlier than expected, but thankfully they were more than happy to go and have a wee dram in the pub. At 12.30pm I go to find them all and run through their itinerary for their time on the island, before leaving them to finish their drinks while I return to the office to answer some emails. The German group are a mixture of bloggers and journalists, and even a famous German chef. I show them up to their rooms, they all seem lovely and (luckily) have excellent English. While most of them settle in I show the chef the kitchen and talk him through the ingredients I’ve sourced for him to cook with. I then take them back to the hotel bar where they are going to have lunch and then go on an island bus tour at 2pm. 2pm; the distillery tour leaves, so I stay to watch the shop. I spend the next hour flitting between office and shop (It is a very rainy day, and also Islay show day, so we are not too busy). Once the tour guide gets back into the shop I am free to finish of the last of my emails, before my tour at 4pm. 4pm; the German group return and I take 5 of them on a private tour of the distillery. It is really enjoyable, they are all very interested, as they are all lifestyle writers it’s actually a great thing that they are able to take photos everywhere in the distillery. 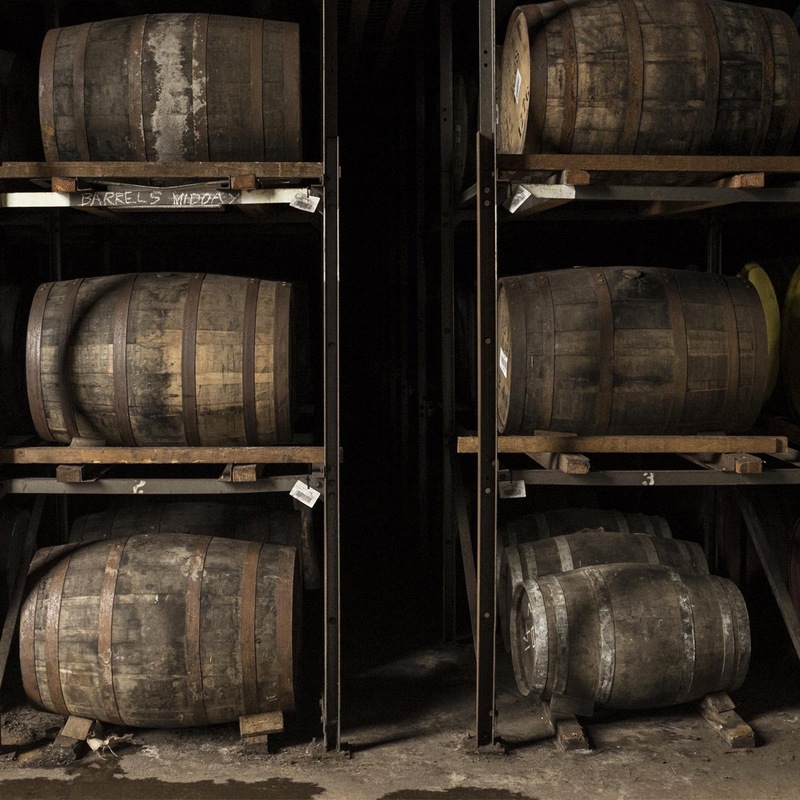 It is always interesting going on tour with folk who love photography; it makes me look at the distillery in a different way. After the tour we go into the visitor centre, and I give them all a dram of 21 year old (as everyone seems to prefer un-peated whisky) and as a really special treat a dram of Jura 1977, it’s a beautiful drink over 35 years old with a port finish, delicious! After they finish their drams and taking photos, they all leave to go and have a rest before dinner. 5.30pm/6pm; I lock up the shop and offices and head up to the lodge with some extra whisky that the chef may need for cooking. I start setting the table for dinner while chatting to the chef, he is a great guy and really interesting so that helps pass the time while polishing glasses and cutlery! At about 7pm the rest of arrive, I have lined up a few whiskies in the middle of the table along with plenty of Copita glasses, all ready to enjoy Chef’s specially created dishes using locally sourced ingredients and paired with Jura Whisky. Dinner is absolutely fantastic, 4 beautiful courses each perfectly matched with Jura whisky, there were some wonderfully unexpected matches, and I really feel like I have learnt a lot from this meal! Around the dinner table everyone seems happy and content and I hope that they are enjoying their time on Jura. At 11pm it is time for me to go home and leave the guys to chat and enjoy the whisky, I give them all a small gift and take some of the left overs to the guys on night shift in the distillery. I stop in at the hotel to double check the booking time for the groups breakfast in the morning, then I call up to the lodge to let them all know. 11.30pm; Home and straight to bed! Another great addition to this series, I am sure you will all agree the insights these features are giving make for a fantastic read. I would like to thank Rachael for her time and for agreeing to take part.. I look forward to meeting up when I get over to the island.. Previous Post WHY VISIT A DISTILLERY? Next Post Glendronach 1990 Single cask. Batch 14. Thanks for some fantastic posts in this series. I can’t wait to catch up with the others. I visit the distillery in a month time so will able to say hello. Like the article so thank you for writing such a piece. A very nice read and great detail, but sounds like a long day ! Another great read, thank you . Is it worthy to visit distillery? Damn right it is! With all highly dedicated people behind liquid sunshine production, like Rachael Jones, it is experience like no other. Great piece Sorren! Lovely review and insight in to Rachael’s day to day life at Jura. Added to my shopping list.